10 different places where you are starved, tortured, and worked mercilessly. It's something no one could imagine surviving. But it is what Yanek Gruener has to face. As a Jewish boy in 1930s Poland, Yanek is at the mercy of the Nazis who have taken over. Everything he has, and everyone he loves, have been snatched brutally from him. And then Yanek himself is taken prisoner -- his arm tattooed with the words PRISONER B-3087. He is forced from one nightmarish concentration camp to another, as World War II rages all around him. He encounters evil he could have never imagined, but also sees surprising glimpses of hope amid the horror. He just barely escapes death, only to confront it again seconds later. Can Yanek make it through the terror without losing his hope, his will -- and, most of all, his sense of who he really is inside? 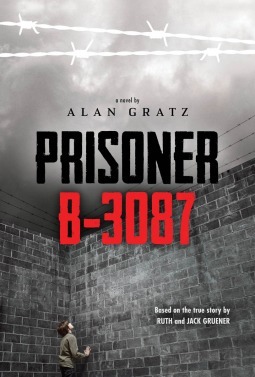 Prisoner B-3087 is a middle grade/early-YA book which is somewhat based on the true story of Jack Gruener, called Yanek in the story, who survived ten different concentration camps during World War II. The story is told with a very straight-forward narrative. It doesn't linger on the atrocities he endures in great or lurid detail, but it doesn't ignore them or try to hide them. By the time Yanek begins to be shuffled from camp to camp, he is well aware of the death that surrounds him. He's still determined to survive and even in the most dire of situations, he doesn't lose hope. He shows a lot of strength, faith, and bravery when many others simply couldn't continue living in the brutal conditions of the concentration camps. I think the biggest drawback was that it was hard to connect emotionally with Yanek, because the story is told in such a detached, simple voice. Here's a young boy who endures unspeakable trauma, but the book seemed for the most part to be lacking in the emotional hook that I would have wanted to see. This may be a case of me being too old for the book, though -- I would be interested to see how someone who is in the book's target audience feels about this. As an adult reader who's spent a lot of time reading about and studying this time period, I expected more, but the same may not be true for a young reader. I think this book would be best for pre-teens/early teens or less advanced readers who are interested in reading stories about this time period but who perhaps may not be ready (for whatever reason) for the more dense historical texts. For readers who haven't had much exposure to WWII/the Holocaust, it may be best to have a parent read along to help facilitate discussion, or to read it when your child is studying that time period.